The land of Hoa Binh is well known not only for its poetic mountains and forest but also for the impression in foods. 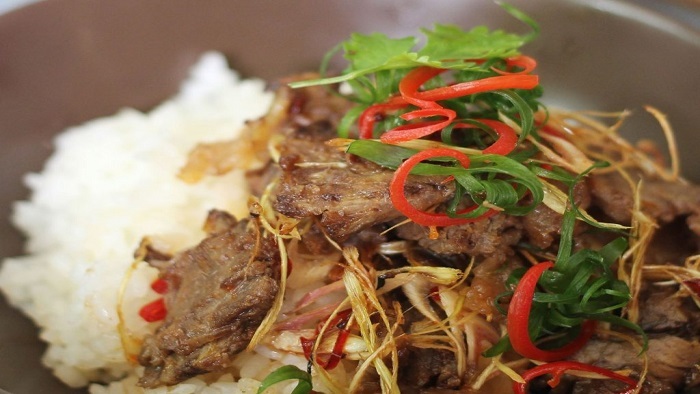 One of the most famous and delicious specialty here is the Muong pig. 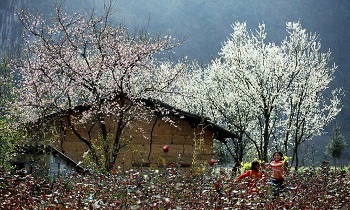 This is the food expressing the flavor of the Muong people and the distinct beliefs of the Northwest culinary culture. 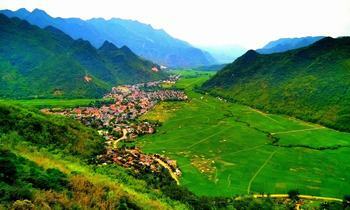 Let's come to Mai Chau 1 day tour to enjoy this specialty of Mai Chau. 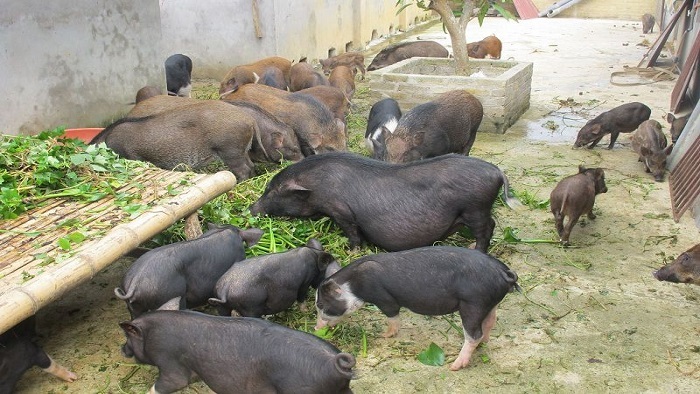 Muong pigs (also called Man pigs, “cap nach” pigs) have long body, pointed muzzle, small ears, thin legs, long and hard hairs which are raised in natural conditions. They graze in the forest and only eat leaves and grass, so their meat is firm, lean, low-fat, delicious, and fresh-tasted. On the holidays or festivals, the Muong people in Hoa Binh usually slaughter pigs and process into dishes such as boiled, roasted, “rua man” (or fake dog meat), meat rolls with Vietnamese curry leaves, pig tripe, etc, to celebrate. When plucking, Muong people do not flush boiling water to the pig as the normal ones but use the soot taken from burning straw or “gianh” grass (the grass people use to make the home roof). Therefore, the original taste of pork will be retained and the skin is yellow as honey. 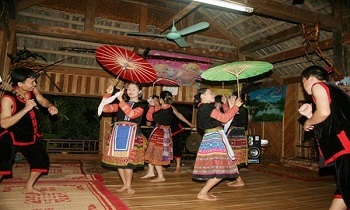 Leaf tray is one of the cultural characteristics of the Muong ethnic minority. As the Muong in Da Bac, those in Hoa Binh also have this dish on the traditional New Year holidays. 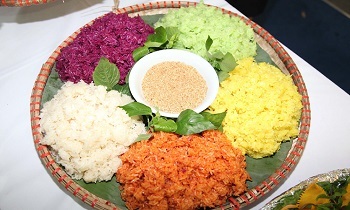 Unlike the Dao, the tray of the Muong people is arranged in a certain order. The leaf tray is shaped roundly and meticulously, fully arranged, symbolizing for the sufficiency. Previously, in their feast, the Muong pork was mainly cooked by boiling or steaming. Today, the processing method has changed, the dish is more varied and unique than before. Also, in the leaf tray, there must be full of parts of the Muong pig, especially the tripe. 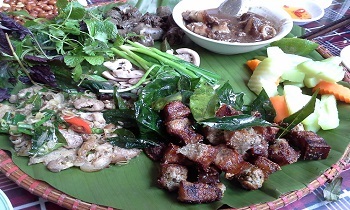 After fully processing the dish from the Muong pork, they will display it on banana leaves put in a tray. The banana leaves here must be soft and aromatic which are the characteristics of mountains and forests, mixed with the attractive color of the tray. 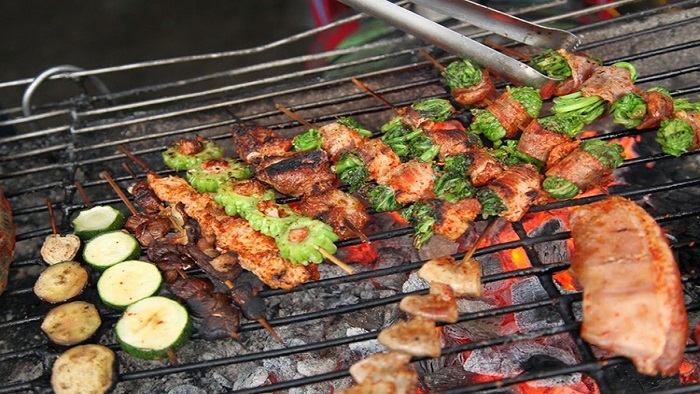 The best dish of Muong pork must be the grilled pork. People will pick the meat that a half is lean and the other half is fat, then wash the skin, slice into thin slices, and marinate it with spices such as galangal, lemongrass, shrimp paste, fish sauce, white wine, Vietnamese curry leaves, etc, for about 30 minutes. Afterward, the pork will be grilled on charcoal. The cooked meat will have a cockroach wing color and a charming smell of the burned edge. If tourists do not want to eat grilled dishes, the boiled pork is a good choice for them. Pork is cut into small pieces, washed, and boiled in a pot. People do not boil the meat too much because the pork will be shrunken and the sweetness characteristic of it will be lost. The Muong people do not dot the boiled pork with fish sauce but dot with a special kind of sauce make from salt mixed with “hat doi” (a seed spice only raised in the Northwest). Specifically, white salts will be roasted to dry and then crushed with “hat doi”. When eating, tourists will taste a strong flavor with an aroma of the seed that is very strange. Fried Muong pork is the familiar dish appeared in the daily meals of the villagers and also one of the attractive things to eat in Hoa Binh. The dish is not very sophisticated but very attractive. People just need to marinate the pork with curry powder, oyster sauce, fish sauce, salt, and some featured kinds of forest leaves and then fry. The bowl of the blood pudding is the mixture of the red color of blood, blue color of the fragrant leaves, light yellow color of peanuts mixed with meat and cartilage, expressing a strange taste which is crunchy with cartilage and fresh with blood. The dish is processed by the Muong people who have their own recipes from limiting to processing blood to create a delicious bowl of blood pudding. In the cold weather of the forest, the “rua man” with a tasty flavor is the dish travelers cannot ignore. Pig legs are the raw material for processing this dish. They are washed, cut into small pieces, marinated with spices such as galangal, fermented rice, salt, and shrimp paste, etc, for about 30 minutes to infiltrate, then put in the cooking pot on a small fire. When the meat is almost medium, people will irrigate a little pig blood to make the dish have a beautiful ripe plum color. The feast of the Muong people cannot lack the Loong soup. This is a dish made from the bowel of the wild banana tree, boiled meat water, bones and lolot leaves. The banana tree is cut down to take the bowel inside which will be sliced into thin and small slices, rubbed with salt discharge the acrid taste. First, the pig bones will be put into the boiling pot, then mixed with the bowel of the banana tree, few crushed “hat doi”, and lolot leaves. This soup is very cool and sweet, reflecting the soul of the Muong people here in particular and the Northwest ethnic minorities in general. Besides these dishes above, Muong pork is also processed into other strange and delicious dishes such as Vietnamese curry leaf mixed pork balls, grapefruit leaf wrapped pork rolls, lolot leaf wrapped pork rolls, pork steamed with lemongrass, rotated pork, etc. 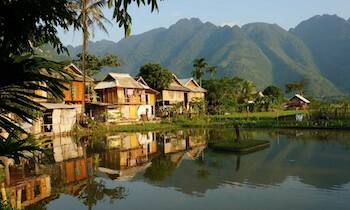 Furthermore, if you’re planning to go Thung Nai, Hoa Binh, don’t forget to visit Mai Chau. Our tour will supply all necessary information from Mai Chau’s specialties, the best time to visit Mai Chau to the popular festivals in Mai Chau that you should not miss. Those who have enjoyed the Muong pork cannot forget the rich flavor made from simple ingredients that contain the simplicity and sincerity of the people here. 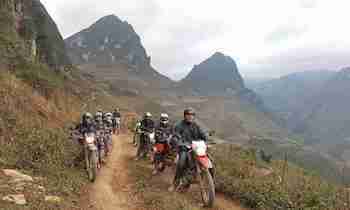 If you need more information about Hanoi Mai Chau tour 1 day, don’t hesitate to leave your idea on our website. Please like and share if it is helpful for you. Thank you.